Devon is walking heaven both for the occasional day out and for the serious hiker. Walking Trails cross moorland, wooded valleys, rural farmland, fantastic scenic coastal routes and designated Areas of Outstanding Natural Beauty. Some places are of serious scientific interest both for geological and biological reasons. 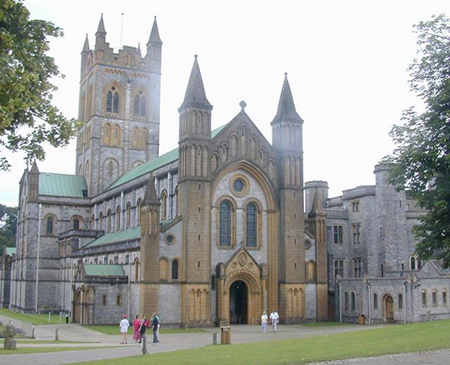 Devon is covered in archaeological sites from ancient standing stones to Norman castles. is a walking trail of 180 miles in a figure of eight centred on Barnstaple and waymarked by otter prints. Both trains and National Express coaches visit the town. The Tarka Line Railway runs from Exeter adding a further dimension to this delightful Trail. The railway actually completes the final leg back to Barnstaple from Eggesford. A Trail for both ramblers or cyclists. 43 miles. Apart from a couple of climbs this interesting route is mostly easy walking. It is waymarked and links Okehampton with the Exe Valley at Stoke Canon. You will get sidetracked so allow time! As different as Uncle Tom Cobley and Jam & Jerusalem! Crediton makes a good place for a stop. which is also known as The Foxglove Way. 38 miles waymarked with the Foxglove sign. Runs from Exmouth to Uplyme just over the border in Dorset, through an Area of Outstanding Natural Beauty. Rambles uphill and down dale through rolling countryside, but some it is level. Its delight is too that it can be broken up into shorter walks. From Okehampton to Plymouth via Tavistock, 36 miles of varied walking round the western edge of Dartmoor. A trail that runs parallel to bus routes so it is easy to walk a little at a time for a pleasant day out. Walking is not too difficult. Wander along river valleys, open moorland, and peaceful rural haunts. The path is waymarked except over the open moorland sections. The trail connects with Two Castles Trail and Dartmoor Way at its northern end, South West Coast Path, Erne-Plym Trail, and The Tarka Trail. To make it the West Devon Way it also connects with the Tamar Valley Discovery Trail and the Cross City Link Walk, both at Plymouth. A circuit round the west of Devon. Okehampton and Launceston. Apart from a couple of hill climbs, the Trail is not strenuous. Launceston is just over the Devon/Cornish border. Bus services at both ends of the walk and there is a train to Okehampton from Exeter on a Sunday. West Devon Way, Dartmoor Way. 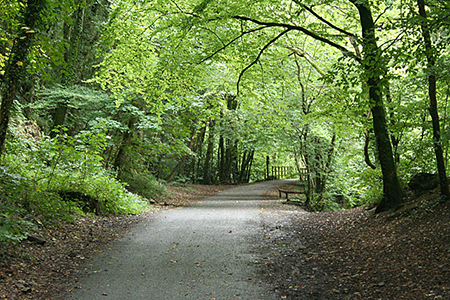 Tamar Discovery Trail, The Tarka Trail and the Devon Hearltand Way connect. 18 miles from Haytor to Teignmouth. It is downhill from Haytor – so that is the easiest way! This one celebrates Devon's industrial past. The first part runs over the tramway that George Templer built to move the quarried granite from Haytor to the Canal. The middle is Stover Country Park and Ted Hughes Poetry Trail is situated there. After Stover Park the trail divides, one cross country and the other follows the River Teign. The routes meet again at Teigngrace and Ventiford where the Stover Canal begins. It flows for almost two miles to Jetty Marsh. The canal is being restored by the The Stover Canal Society . 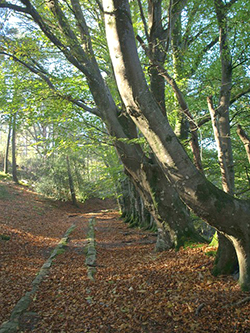 Enjoy the numerous and delightful walking trails in Devon. Many of these trails could become short breaks. Or they can be explored in bite sized bits for days out.